Angry Asian Buddhist: A Bit More Than a Smattering? A Bit More Than a Smattering? The much anticipated 2011 Buddhist Teachers Council has finally concluded, in spite of all the griping. It was organized secretly. It was exclusive. But I was more interested in how many Asian participants were invited to the party. Those terms are hard for an unskilled layperson like me to gauge. Fortunately, Rev. Ford posted a list of attendees, which I spent the last few days coding. The list falls short of the 230 mentioned in the press release, but I have to work with what I’ve got. After crunching the numbers, it turns out that “a bit more than a smattering” equates to about one in nine. If you break out the Asian participants, there were just fifteen of us (that’s one in twelve). Thus “a bit more than a smattering” falls short of the representation of Asian writers in The Best Buddhist Writing (one in five), but hangs a couple notches above the paucity of Asian contributors to Tricycle (one in fifteen). Maybe then a “smattering” is the handful of Asians you find in Tricycle. On the other hand, if we look at the inclusion of women at the conference, their representation is much stronger. There were four women for every five men present. That’s a little better balanced. That said, I’m glad for the Buddhists of Color who showed up, including one whom I interviewed on this blog. A strong contingent came from the East Bay Meditation Center, along with several others whose names were entirely new to me. Since this conference is scheduled to recur, I hope the organizers will make an effort to be more inclusive the next time around. For more on the conference from Rev. James Ford’s blog, see here, here, here, here and here. Not to mention photos! Update: This post has been revised to reflect corrections from a Tricycle editor in the comments below. Editors from Tricycle were not in attendance. Where do you get your facts? But hey, why let facts get in the way of a good rant, right? James Shaheen Tricycle editor, was listed on the participants list posted here. Why let a legitimate source get in the way of a snotty snipe? While he may have been invited (though I don't recall hearing from him that he was) James Shaheen did not attend. Therefore the post is wrong when it is written that he was "in attendance." The facts in this case are wrong. One fact is incorrect due to error on the part of a third party, who is generally deemed reliable. That doesn't make this post a rant nor does it discredit any of the other data presented in any way. Too bad Tricycle doesn't apply such scrutiny to it's own house. I must thank Philip Ryan for his corrections, and I have revised my post accordingly. As NellaLou helpfully noted, I relied on Rev. James Ford’s “Participant List,” which unbeknownst to me inaccurately listed James Shaheen as a participant. My penultimate paragraph snarkily expressed my sincere hope that the editors present would be directly exposed to greater numbers of Buddhists of Color—especially Asian Buddhists, who comprised one out of twelve participants—and as a result might be inclined to include more Buddhists of Color (including Asians) in future publication cycles. This hope, however, presupposed the editors’ attendance. In the case of Tricycle, this fact was wrong. Even so, my hope remains. Of the 24 non-review articles in the Summer issue of Tricycle 5 are by people of color. This is more than 1 on 5 and is certainly higher than 1 in 15. The issue includes a cover story by a Vietnamese teacher, a feature about a female Asian-American Shin Buddhist Reverend, an interview with a female African-American abbot, an interview with a female Kenyan Buddhist, a piece on Nepalese history, and highlights 5 Asian or Asian-American Engaged Buddhist charity organizations. @Pawo: Thank you very much for going through all the work behind your comment! There are several very important issues you bring up that I’d like to reply to, but ultimately I have more than enough to say about differing methodologies. I’ll have to leave the other points for a later post next week. Your methodology differs from mine in four key ways. First, I count contributors, not articles. So Jeff Wilson’s interview with Rev. Patti Usuki counts as two people—one of them Asian American. Second, I don’t exclude someone simply because they wrote a review. I want to give Tricycle credit for every Asian voice they include, just as I did for Buddhadharma when they reached out to Francisca Cho to write a review. Third, my one-in-fifteen count is based on Asian contributors, not just People of Color. This last point is evident if you read my post a little more closely. Lastly, the number I linked to was sourced from a count not this year, but two years ago. In that issue, I found 6.4 percent of contributors to be of Asian heritage—a little less than one in fifteen. To compare with the most recent issue, I counted four Asian contributors, which comes out to a bit less than one in eight of the 33 contributors I counted. In addition, she has been interviewed for an article in Tricycle, supposedly for publication in the Autumn issue (depending on editorial decisions, of course). @Mike: Thank you for your question. I count her both as African American and Asian American—so she would count towards Tricycle’s Asian quotient in the fall issue. In the graph above, this distinction is moot, as it broadly counts People of Color. Hey, I was there, and there were definitely more than 20 people of color. I don't know how you determined who was of color or not. Some folks have Asian names but are white; some folks had Euro names but are of color; some folks "look white" but are actually mix or of color; some folks look not white but actually are. Etc. I know for certain that at least 11 of the younger teachers were of color, and young teachers only made up 1/4 of those there. I didn't read everything else thoroughly, but I just wanted to question the numbers. Also, a great deal of the conference was spent looking at issues of diversity. In fact, I would say this was the major theme, as it turned out. "...many people were invited who did not come. Of about 30 Tibetan teachers, 1 came, and this was discussed--people wanted to understand how we encourage them to accept the invitation." @simplysumi: Thank you for your comments. My apologies for this delayed reply. You bring up at least five very important issues to which I can only respond partially in this comment. First, while my numbers were both inaccurate and incomplete, as I state in my post, (“the list falls short of the 230 mentioned in the press release, but I have to work with what I’ve got”)—there is nothing that tells me that the proportions I derived were wholly unrepresentative. The main number I looked at was the ratio of People of Color to all participants: about one in nine. You question the accuracy of these numbers in two ways. First, there is the apparent assumption that one could estimate the total number of PoC participants based on the 11 PoCs in the young teachers group; this assumption is probably untenable. Second, you question if I correctly counted PoCs. I didn’t merely look at names and/or photos; you can find the ethnicity of almost all Buddhists of Color attending either in their own writing, in writing about them or through acquaintances who know them. I most appreciate your last two points, though—that much time was spent looking at issues of diversity and that many invitations were sent, but not responded to. 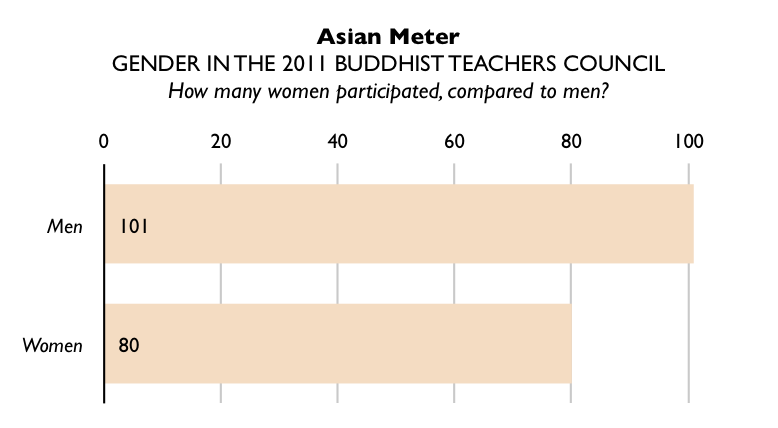 Though such beneficence must be lauded, these facts fail to undermine the main point that Buddhists of Color were vastly underrepresented, and I have yet to hear of any of the organizers take responsibility for this fact. I understand that the criticism in my writing ignores all the benefit that you and others gained from the gathering. I am sure that there are lessons to be learned from this conference to ensure that future engagements will be even more diverse, but such progress can only occur when the organizers accept responsiblity both that there was a profound lack of diversity and that outreach could have been done better. @rev-harry: I’m sad you couldn’t make it. I heard it was a marvellous experience! How many did you want there? What the baseline? Looking at the American census I presume 32 on 160 but I could be wrong. Actually it is descendants of people from Puerto Rico, Mexico, Cuba and South America which were the least, 1. But actually do you think there should have been more Asian Americans because there are naturally/culturally Buddhists than any other people of color? Even though many of them like in Korea are Christians. There was a very good meeting of people of color and their allies one afternoon at the Garrison Conference. I am sure the organizers will do better next time, if there is a next time. Some people do not seem to want certain Buddhist teachers to meet. @buddhistonthego: I’ll have to respond to your question about baselines tomorrow in a separate post. It is a very good question, but requires a rather more elaborate answer than can fit in this comment space. In the meantime—who exactly are these people who “do not seem to want certain Buddhist teachers to meet”?